Huawei has launched few innovative gadgets in Paris, France on March 26, 2018. 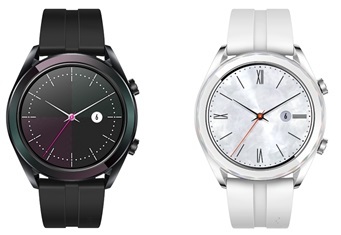 One of them is HUAWEI Watch GT Active and Elegant Editions, other than Huawei P30 smartphone series. The same GT series (Classic and Sport) was released earlier and sold more than 1 million unit globally. Huawei WATCH GT has become Huawei’s best-selling smart watch category. So, the brand has launched Active Edition and Elegant Edition in Paris. The Active Edition features the same 46mm watch face as that of HUAWEI WATCH GT Classic Edition and Sport Edition, while the Elegant Edition features a smaller 42mm ceramic bezel option. Huawei has also launched the new HUAWEI Band 3, which is fitted in with 0.95" AMOLED HD color screen for better display. HUAWEI WATCH GT price: Euro 229 (Elegant Edition) HUAWEI Band 3 price: Euro 59. We would update more features on these two watches, later. Stay tuned. Tips: One of the best smartwatch to go with.